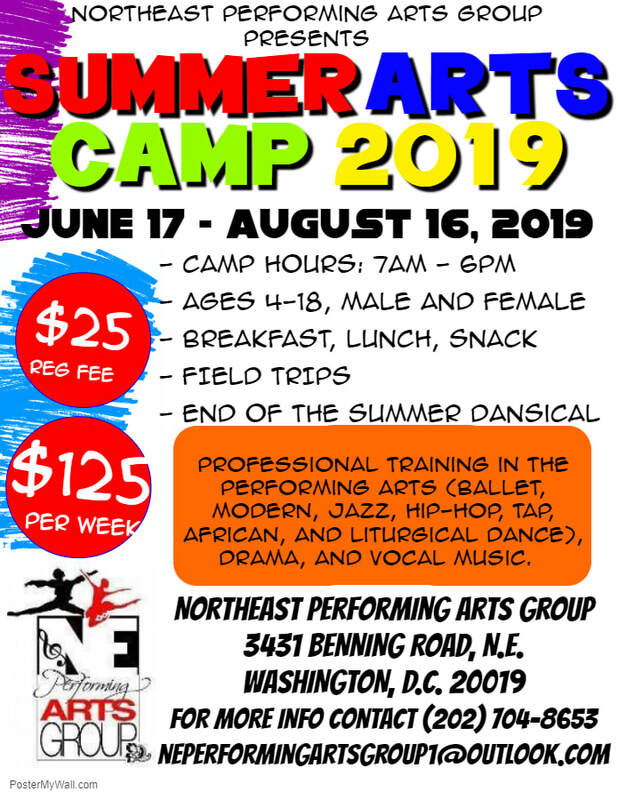 ​The Northeast Performing Arts Group (NEPAG) is currently accepting applications for its upcoming annual Summer Arts Camp (9-week program). As in past years, enrolled participants will receive professional training in the performing arts (ballet, modern, jazz, hip-hop, tap, African, and liturgical dance), drama, and vocal music. NEPAG's 2019 summer program will begin Monday, June 17 and end Friday, August 16, 2019. Camp hours are 7:00 a.m. to 6:00 p.m., Monday through Friday. School-aged boys and girls from five to 18 are eligible to enroll. Registration is $25.00 (one-time non-refundable fee) and tuition is $125 per week (per enrolled child). Weekly tuition includes breakfast, lunch, and a snack; field trips, community performances and an opportunity to perform in the 2019 professional summer production. For more information, please contact (202) 704-8653 or visit NEPAG's studio, located 3431 Benning Road, N.E. (next to the Chateau Remix) today to complete an application and secure your child's enrollment with an $150 advance deposit.